Hey, já amanheceu! Você já está acordado? Já tomou o seu café da manhã? Se ainda não, então pegue uma enorme xícara de café e vamos aproveitar esse horário da manhã para estudar todas as horas em inglês por extenso dentro do período das 07:00 às 07:59. Em todos os minutos em inglês, aprenderemos diversas formas de como dizer as horas em inglês. Então, como são várias opções, sugerimos o uso da ferramenta Anki para te auxiliar em uma memorização mais rápida através de um processo chamado Spaced Repetition (Repetição Espaçada) que consiste em repetir os estudos em intervalos de tempos maior. Dê uma olhada nesse tutorial completo aonde explicamos detalhadamento o que é o Anki e como instalar e configurar. Vamos começar nosso estudo aprendendo a dizer a hora exata em inglês (07:00). Esse horário é o mais simples e mais fácil de todos. E particularmente tem o uso frequente do termo “o’clock” para especificar o horário em ponto, ou seja, 7 horas em ponto. Vamos aprender na tabela abaixo como dizer as horas em inglês das 07:00 às 07:14. One minute past seven One minute past seven a.m.
One past seven One past seven a.m.
Fifty-nine minutes to eight Fifty-nine minutes to eight a.m. Seven one Seven one a.m.
Two minutes past seven Two minutes past seven a.m.
Two past seven Two past seven a.m.
Fifty-eight minutes to eight Fifty-eight minutes to eight a.m. Seven two Seven two a.m.
Three minutes past seven Three minutes past seven a.m.
Three past seven Three past seven a.m.
Fifty-seven minutes to eight Fifty-seven minutes to eight a.m. Seven three Seven three a.m.
Four minutes past seven Four minutes past seven a.m.
Four past seven Four past seven a.m.
Fifty-six minutes to eight Fifty-six minutes to eight a.m. Seven four Seven four a.m.
Five minutes past seven Five minutes past seven a.m.
Five past seven Five past seven a.m.
Fifty-five minutes to eight Fifty-five minutes to eight a.m. Seven five Seven five a.m.
Six minutes past seven Six minutes past seven a.m.
Six past seven Six past seven a.m.
Fifty-four minutes to eight Fifty-four minutes to eight a.m. Seven six Seven six a.m. Seven minutes past seven Seven minutes past seven a.m. Seven past seven Seven past seven a.m.
Fifty-three minutes to eight Fifty-three minutes to eight a.m. Seven seven Seven seven a.m. Eight minutes past seven Eight minutes past seven a.m. Eight past seven Eight past seven a.m.
Fifty-two minutes to eight Fifty-two minutes to eight a.m. Seven eight Seven eight a.m.
Nine minutes past seven Nine minutes past seven a.m.
Nine past seven Nine past seven a.m.
Fifty-one minutes to eight Fifty-one minutes to eight a.m. Seven nine Seven nine a.m. Ten minutes past seven Ten minutes past seven a.m. Ten past seven Ten past seven a.m.
Fifty minutes to eight Fifty minutes to eight a.m. Seven ten Seven ten a.m.
Eleven minutes past seven Eleven minutes past seven a.m.
Eleven past seven Eleven past seven a.m.
Forty-nine minutes to eight Forty-nine minutes to eight a.m. Seven eleven Seven eleven a.m.
Twelve minutes past seven Twelve minutes past seven a.m.
Twelve past seven Twelve past seven a.m.
Forty-eight minutes to eight Forty-eight minutes to eight a.m. Seven twelve Seven twelve a.m.
Thirteen minutes past seven Thirteen minutes past seven a.m.
Thirteen past seven Thirteen past seven a.m.
Forty-seven minutes to eight Forty-seven minutes to eight a.m. Seven thirteen Seven thirteen a.m.
Fourteen minutes past seven Fourteen minutes past seven a.m.
Fourteen past seven Fourteen past seven a.m.
Forty-six minutes to eight Forty-six minutes to eight a.m. Seven fourteen Seven fourteen a.m.
No inglês, é usado muito o termo “past” para especificar que já se passaram tantos minutos após a hora exata. E para o caso dos 15 minutos em inglês, é muito usado o termo “a quarter past” para especificar que já se passaram 1/4 da hora cheia. Vamos ver abaixo como usar esse termo e vamos ver também como dizer as horas em inglês das 07:15 às 07:29. Fifteen minutes past seven Fifteen minutes past seven a.m.
Fifteen past seven Fifteen past seven a.m.
Forty-five minutes to eight Forty-five minutes to eight a.m. Seven fifteen Seven fifteen a.m.
A quarter past seven A quarter past seven a.m.
Sixteen minutes past seven Sixteen minutes past seven a.m.
Sixteen past seven Sixteen past seven a.m.
Forty-four minutes to eight Forty-four minutes to eight a.m. Seven sixteen Seven sixteen a.m.
Seventeen minutes past seven Seventeen minutes past seven a.m.
Seventeen past seven Seventeen past seven a.m.
Forty-three minutes to eight Forty-three minutes to eight a.m. Seven seventeen Seven seventeen a.m.
Eighteen minutes past seven Eighteen minutes past seven a.m.
Eighteen past seven Eighteen past seven a.m.
Forty-two minutes to eight Forty-two minutes to eight a.m. Seven eighteen Seven eighteen a.m.
Nineteen minutes past seven Nineteen minutes past seven a.m.
Nineteen past seven Nineteen past seven a.m.
Forty-one minutes to eight Forty-one minutes to eight a.m. Seven nineteen Seven nineteen a.m.
Twenty minutes past seven Twenty minutes past seven a.m.
Twenty past seven Twenty past seven a.m.
Forty minutes to eight Forty minutes to eight a.m. Seven twenty Seven twenty a.m.
Twenty-one minutes past seven Twenty-one minutes past seven a.m.
Twenty-one past seven Twenty-one past seven a.m.
Thirty-nine minutes to eight Thirty-nine minutes to eight a.m. Seven twenty-one Seven twenty-one a.m.
Twenty-two minutes past seven Twenty-two minutes past seven a.m.
Twenty-two past seven Twenty-two past seven a.m.
Thirty-eight minutes to eight Thirty-eight minutes to eight a.m. Seven twenty-two Seven twenty-two a.m.
Twenty-three minutes past seven Twenty-three minutes past seven a.m.
Twenty-three past seven Twenty-three past seven a.m.
Thirty-seven minutes to eight Thirty-seven minutes to eight a.m. Seven twenty-three Seven twenty-three a.m.
Twenty-four minutes past seven Twenty-four minutes past seven a.m.
Twenty-four past seven Twenty-four past seven a.m.
Thirty-six minutes to eight Thirty-six minutes to eight a.m. Seven twenty-four Seven twenty-four a.m.
Twenty-five minutes past seven Twenty-five minutes past seven a.m.
Twenty-five past seven Twenty-five past seven a.m.
Thirty-five minutes to eight Thirty-five minutes to eight a.m. Seven twenty-five Seven twenty-five a.m.
Twenty-six minutes past seven Twenty-six minutes past seven a.m.
Twenty-six past seven Twenty-six past seven a.m.
Thirty-four minutes to eight Thirty-four minutes to eight a.m. Seven twenty-six Seven twenty-six a.m.
Twenty-seven minutes past seven Twenty-seven minutes past seven a.m.
Twenty-seven past seven Twenty-seven past seven a.m.
Thirty-three minutes to eight Thirty-three minutes to eight a.m. Seven twenty-seven Seven twenty-seven a.m.
Twenty-eight minutes past seven Twenty-eight minutes past seven a.m.
Twenty-eight past seven Twenty-eight past seven a.m.
Thirty-two minutes to eight Thirty-two minutes to eight a.m. Seven twenty-eight Seven twenty-eight a.m.
Twenty-nine minutes past seven Twenty-nine minutes past seven a.m.
Twenty-nine past seven Twenty-nine past seven a.m.
Thirty-one minutes to eight Thirty-one minutes to eight a.m. Seven twenty-nine Seven twenty-nine a.m.
A meia hora em inglês, tem uma forma específica de falar as horas em inglês aonde se usa o termo “half past” para especificar que já se passaram meia hora após a hora exata em inglês. Vamos ver na tabela abaixo como esse termo é representado, e depois vamos ver também como dizer as horas em inglês das 07:30 às 07:44. Thirty minutes past seven Thirty minutes past seven a.m.
Thirty past seven Thirty past seven a.m.
Thirty minutes to eight Thirty minutes to eight a.m. Seven thirty Seven thirty a.m.
Half past seven Half past seven a.m.
Thirty-one minutes past seven Thirty-one minutes past seven a.m.
Thirty-one past seven Thirty-one past seven a.m.
Twenty-nine minutes to eight Twenty-nine minutes to eight a.m. Seven thirty-one Seven thirty-one a.m.
Thirty-two minutes past seven Thirty-two minutes past seven a.m.
Thirty-two past seven Thirty-two past seven a.m.
Twenty-eight minutes to eight Twenty-eight minutes to eight a.m. Seven thirty-two Seven thirty-two a.m.
Thirty-three minutes past seven Thirty-three minutes past seven a.m.
Thirty-three past seven Thirty-three past seven a.m.
Twenty-seven minutes to eight Twenty-seven minutes to eight a.m. Seven thirty-three Seven thirty-three a.m.
Thirty-four minutes past seven Thirty-four minutes past seven a.m.
Thirty-four past seven Thirty-four past seven a.m.
Twenty-six minutes to eight Twenty-six minutes to eight a.m. Seven thirty-four Seven thirty-four a.m.
Thirty-five minutes past seven Thirty-five minutes past seven a.m.
Thirty-five past seven Thirty-five past seven a.m.
Twenty-five minutes to eight Twenty-five minutes to eight a.m. Seven thirty-five Seven thirty-five a.m.
Thirty-six minutes past seven Thirty-six minutes past seven a.m.
Thirty-six past seven Thirty-six past seven a.m.
Twenty-four minutes to eight Twenty-four minutes to eight a.m. Seven thirty-six Seven thirty-six a.m.
Thirty-seven minutes past seven Thirty-seven minutes past seven a.m.
Thirty-seven past seven Thirty-seven past seven a.m.
Twenty-three minutes to eight Twenty-three minutes to eight a.m. Seven thirty-seven Seven thirty-seven a.m.
Thirty-eight minutes past seven Thirty-eight minutes past seven a.m.
Thirty-eight past seven Thirty-eight past seven a.m.
Twenty-two minutes to eight Twenty-two minutes to eight a.m. Seven thirty-eight Seven thirty-eight a.m.
Thirty-nine minutes past seven Thirty-nine minutes past seven a.m.
Thirty-nine past seven Thirty-nine past seven a.m.
Twenty-one minutes to eight Twenty-one minutes to eight a.m. Seven thirty-nine Seven thirty-nine a.m.
Forty minutes past seven Forty minutes past seven a.m.
Forty past seven Forty past seven a.m.
Twenty minutes to eight Twenty minutes to eight a.m. Seven forty Seven forty a.m.
Forty-one minutes past seven Forty-one minutes past seven a.m.
Forty-one past seven Forty-one past seven a.m.
Nineteen minutes to eight Nineteen minutes to eight a.m. Seven forty-one Seven forty-one a.m.
Forty-two minutes past seven Forty-two minutes past seven a.m.
Forty-two past seven Forty-two past seven a.m.
Eighteen minutes to eight Eighteen minutes to eight a.m. Seven forty-two Seven forty-two a.m.
Forty-three minutes past seven Forty-three minutes past seven a.m.
Forty-three past seven Forty-three past seven a.m.
Seventeen minutes to eight Seventeen minutes to eight a.m. Seven forty-three Seven forty-three a.m.
Forty-four minutes past seven Forty-four minutes past seven a.m.
Forty-four past seven Forty-four past seven a.m.
Sixteen minutes to eight Sixteen minutes to eight a.m. Seven forty-four Seven forty-four a.m.
Aprendemos acima que o uso do “past” (passado) serve para especificar que já se passaram X minutos após uma determinada hora exata em inglês (ex. : 40 minutos passado das 7). Mas existe também a possibilidade de se fazer o contrário, ou seja, em vez de dizermos a quantidade de minutos em inglês que já se passaram, podemos dizer a quantidade de minutos em inglês que faltam para chega ao próximo horário (ex. : 20 minutos para as 8). E para isso, usamos o “to” (para). E outro ponto importante para relembrar e não esquecer mais, é o uso do termo “a quarter to” para os horários de 45 minutos em inglês. 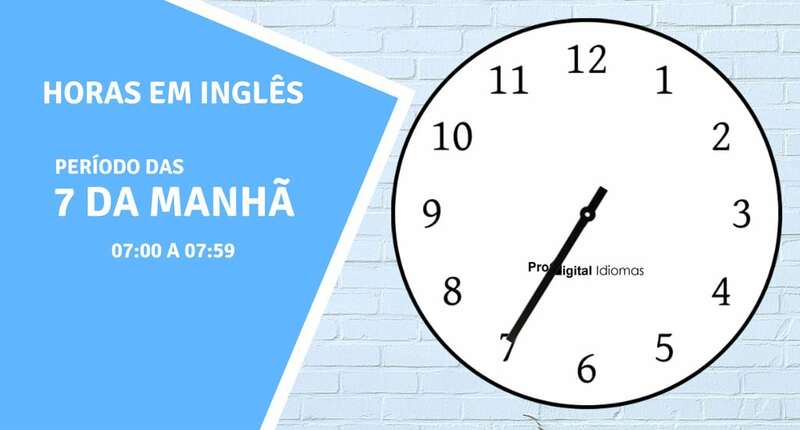 E é frequentemente usado para especificar que faltam 1/4 de hora (15 minutos) para o próximo horário em inglês. Na tabela abaixo podemos ver como ele é representado. E depois vamos seguir aprendendo como dizer as horas em inglês das 07:45 às 07:59. Forty-five minutes past seven Forty-five minutes past seven a.m.
Forty-five past seven Forty-five past seven a.m.
Fifteen minutes to eight Fifteen minutes to eight a.m. Seven forty-five Seven forty-five a.m.
A quarter to eight A quarter to eight a.m.
Forty-six minutes past seven Forty-six minutes past seven a.m.
Forty-six past seven Forty-six past seven a.m.
Fourteen minutes to eight Fourteen minutes to eight a.m. Seven forty-six Seven forty-six a.m.
Forty-seven minutes past seven Forty-seven minutes past seven a.m.
Forty-seven past seven Forty-seven past seven a.m.
Thirteen minutes to eight Thirteen minutes to eight a.m. Seven forty-seven Seven forty-seven a.m.
Forty-eight minutes past seven Forty-eight minutes past seven a.m.
Forty-eight past seven Forty-eight past seven a.m.
Twelve minutes to eight Twelve minutes to eight a.m. Seven forty-eight Seven forty-eight a.m.
Forty-nine minutes past seven Forty-nine minutes past seven a.m.
Forty-nine past seven Forty-nine past seven a.m.
Eleven minutes to eight Eleven minutes to eight a.m. Seven forty-nine Seven forty-nine a.m.
Fifty minutes past seven Fifty minutes past seven a.m.
Fifty past seven Fifty past seven a.m. Ten minutes to eight Ten minutes to eight a.m. Seven fifty Seven fifty a.m.
Fifty-one minutes past seven Fifty-one minutes past seven a.m.
Fifty-one past seven Fifty-one past seven a.m.
Nine minutes to eight Nine minutes to eight a.m. Seven fifty-one Seven fifty-one a.m.
Fifty-two minutes past seven Fifty-two minutes past seven a.m.
Fifty-two past seven Fifty-two past seven a.m. Eight minutes to eight Eight minutes to eight a.m. Seven fifty-two Seven fifty-two a.m.
Fifty-three minutes past seven Fifty-three minutes past seven a.m.
Fifty-three past seven Fifty-three past seven a.m. Seven minutes to eight Seven minutes to eight a.m. Seven fifty-three Seven fifty-three a.m.
Fifty-four minutes past seven Fifty-four minutes past seven a.m.
Fifty-four past seven Fifty-four past seven a.m.
Six minutes to eight Six minutes to eight a.m. Seven fifty-four Seven fifty-four a.m.
Fifty-five minutes past seven Fifty-five minutes past seven a.m.
Fifty-five past seven Fifty-five past seven a.m.
Five minutes to eight Five minutes to eight a.m. Seven fifty-five Seven fifty-five a.m.
Fifty-six minutes past seven Fifty-six minutes past seven a.m.
Fifty-six past seven Fifty-six past seven a.m.
Four minutes to eight Four minutes to eight a.m. Seven fifty-six Seven fifty-six a.m.
Fifty-seven minutes past seven Fifty-seven minutes past seven a.m.
Fifty-seven past seven Fifty-seven past seven a.m.
Three minutes to eight Three minutes to eight a.m. Seven fifty-seven Seven fifty-seven a.m.
Fifty-eight minutes past seven Fifty-eight minutes past seven a.m.
Fifty-eight past seven Fifty-eight past seven a.m.
Two minutes to eight Two minutes to eight a.m. Seven fifty-eight Seven fifty-eight a.m.
Fifty-nine minutes past seven Fifty-nine minutes past seven a.m.
Fifty-nine past seven Fifty-nine past seven a.m.
One minute to eight One minute to eight a.m. Seven fifty-nine Seven fifty-nine a.m.
E essas são todas as horas em inglês por extenso para o período das 7 da manhã. Espero que tenha gostado. Não deixe de baixar o Anki no seu celular ou computador para te ajudar nos seus estudos.